Cannot find any photos that really do a bit of justice to the magnificence of this natural beauty. 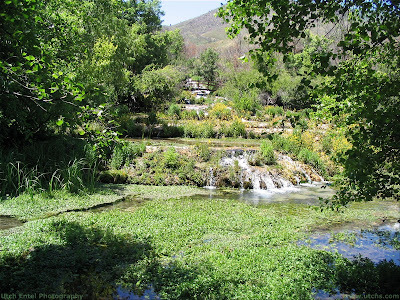 It has been loved by so many visitor through the decades, and enhanced by the addition of the walkway surrounding the quiet flowing springs and pools that spring right up from the rock. Lush vegetation and abundant flowers through an extended growing season are th exceptional attraction, as well as many water-borne species not seen in such collections anywhere else. If there was ever a natural setting for an afternoon walk more at peace with nature, more conducive for reflective thought, better for having the kids race each other around in circles to exhaustion, and fine fried chicken picnics, I cannot think of a place. Links are plentiful, try here. That sounds so good, I wish it was late spring this very minute. I need a day like that right about now. I think I'm going to close my eyes and just see myself there, hear the babble of the spring as it flows by, and feel the sun on my face. Thanks for this one, especially.